Phentemine 375, or more commonly known as "Phen375" is supposedly a "pharmacy grade" weight loss product made by RDK Global. The company has been established for the past seven years and is based in Dallas, Texas. On their website, the company claims that many people are satisfied with the product. However, because the pills are only available on the company website, it was difficult to truly find unbiased reviews of the pills. Our researchers did find some mixed reviews of the product, but read on to find out what they truly learned. Phen375 is weight loss product that theoretically works mostly through helping with hunger. The company that makes the drug states that using Phen375 will reduce the users appetite. In order to accomplish this, Phen375 uses a mix of ingredients which include Calcium Carbonate, Chromium, L-Carnitine, Citrus Aurantium, Caffeine Powder Anhydrous, Cayenne, Dendrobium Nobile, and Coleus Forskohlii Root PE. Unfortunately, the problem with the above ingredients is that they are not all natural. The makers of Phen375 know that and never claim that their product is made with 100% all natural ingredients. Some of their ingredients could cause some nasty side effects. Chromium, for instance, may help with hunger control, but it can also cause liver problems, nausea, and jaundice. Then there's caffeine, which most people think is safe, but could be dangerous in high doses. Potentially, caffeine could lead to headaches, the shakes, and the inability to sleep when needed. It is hard for us to name the top benefits for this product, but supposedly, according to the company, customers have had some success using it. 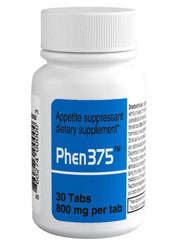 Phen375 uses unnatural ingredients which may cause liver problems, nausea, jaundice, the shakes, and headaches. Their return policy is very strict and does not offer a money back guarantee unless the product is unused. After learning about these potential side effects and being unsure about how effective Phen375 actually is, our team was really hoping for a solid 100% money back guarantee offer. Unfortunately, we did not get it. In our opinion, Phen375 has a very shaky return policy. According to their policy, customers are required to return their package with an RMA number and any package returned without one will not be refunded. This is a bit bothersome, but the real problem is that "damaged or altered bottles, seals or labels will be refused by (the) Phen375.com recieving department". If you try the product you can not return it even if it has no effect on you. Obviously, this is a problem because how are you supposed to know if it works unless you try it. Many other weight loss companies understand this and offer more forgiving return policies. Unfortunately, most of the reviews we found on the product were from the company website which suspiciously stated that the pills are well received. We did, however, find some bloggers who claimed that the pill had little to no effectiveness. Therefore, we believe that the pills has mixed reviews. We believe our readers can definitely do better than this product.